Today I’m enjoying a taste of Spain in Covent Garden. Two of my favourite places in one! I love tapas, sharing lots of dishes works for me, after all you get to taste more of the menu. It is believed that this Spanish practice started in Seville where bartenders would cover (tapar in Spanish) wine glasses with a small plate to protect the drink from fruit flies. At first the plate was empty and then they began placing a slice of ham on top, which obviously their customers loved. So to keep customers coming they started creating different dishes to serve in these mini portions. Now tapas is a world-wide phenomenon, and London is packed with delightful Spanish eateries. One of my favourites is Barrafina, so when their third branch opened recently in Covent Garden I couldn’t wait to visit. The restaurant is set up for bar eating with a beautiful marble L-shaped bar in a light-filled contemporary room. It’s a lovely space and you’re greeted by smiling staff as you settle down into one of their plush bar stools. The menu is neatly divided into sections which helps with the ordering quandaries (a little). There’s cold meat, fish, seafood, meat, omelettes and eggs, vegetables and a char grill section. 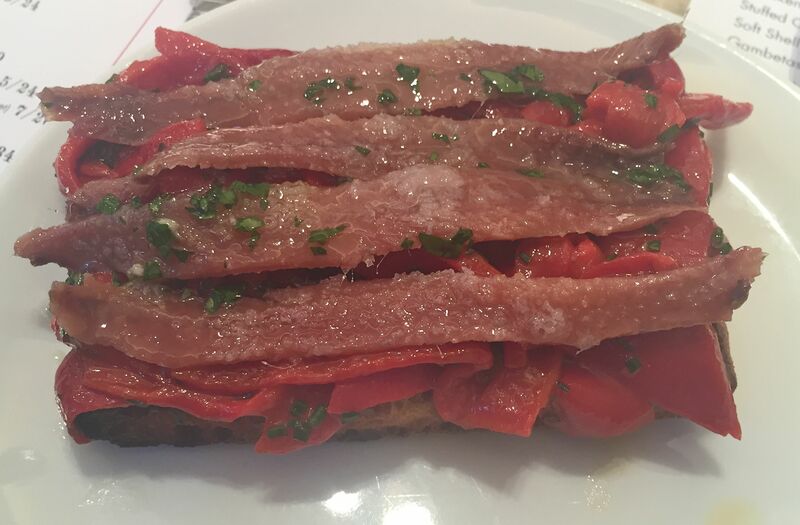 First up we went for roast peppers, anchovies and pan de coca – a special Spanish bread. A wonderful mix of sweet and salty, with a perfect crunch. And then one of my best tapas dishes ever. The pheasant egg and morcilla de Burgos on toast. Morcilla is a sausage similar to black pudding, it’s rich and velvety with an amazing flavour. 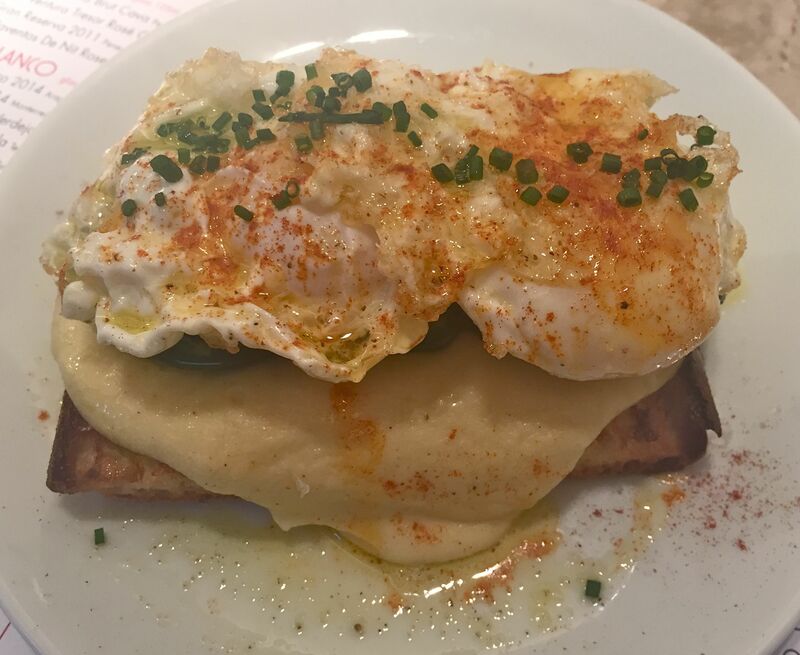 With a hollandaise-like sauce and perfectly fried pheasant eggs (something I’ve never had before) this reminded me of eggs benedict – kind of a more exotic Spanish version. My mouth is watering right now as I think about it. 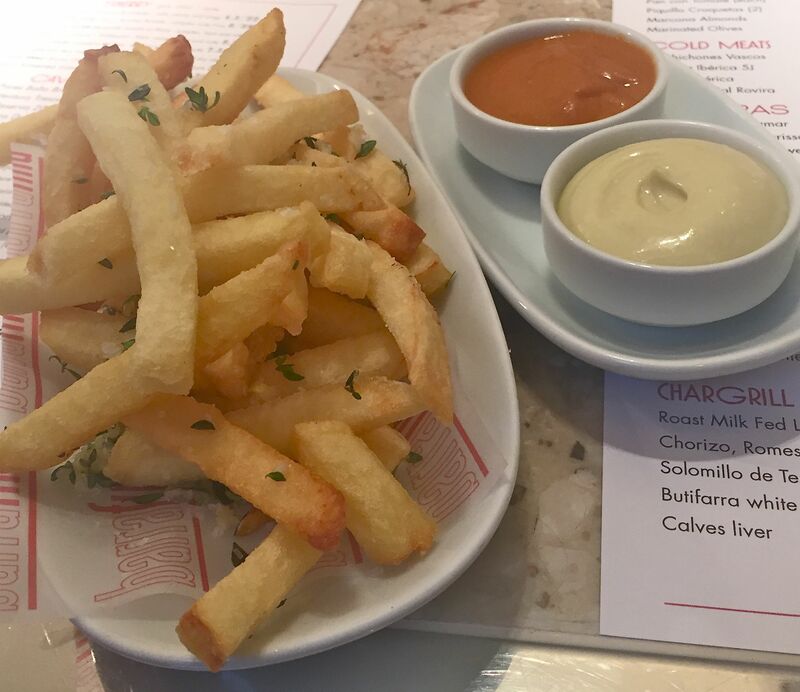 If you go into Barrafina any time soon make sure it’s first on your list to order! And definitely order some chips. They were magnificently garlicky, perfectly cooked and piping hot. 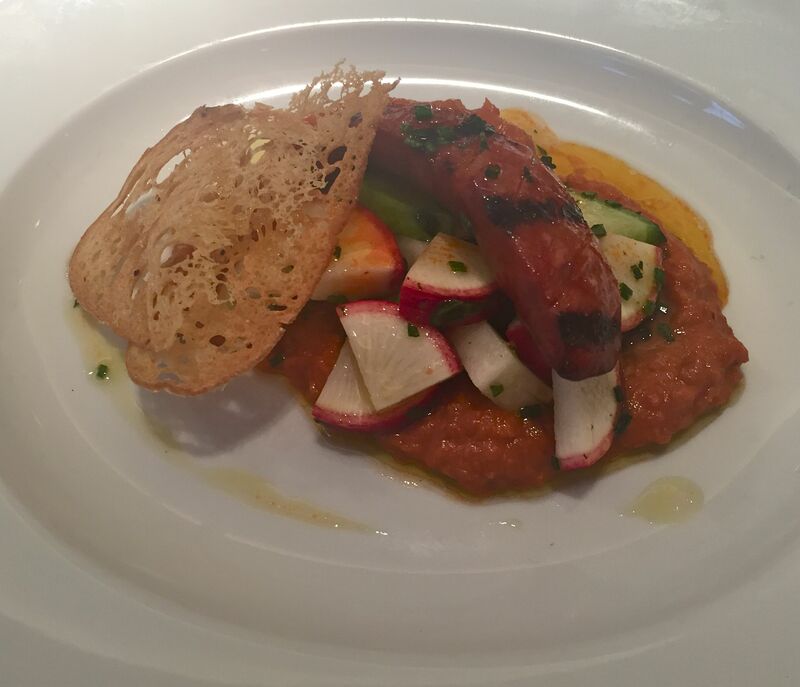 Our final dish came from the Char grill section – chorizo, romesco and radish. I love romesco sauce, made from peppers and almonds and other nuts and it went perfectly with the richness of the chorizo and the freshness and crunchiness of the radishes. 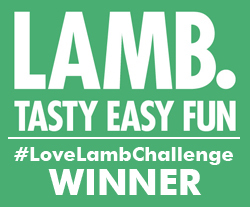 A thoroughly amazing selection of tapas and some of the nicest service I’ve ever had in London. Barrafina does have a policy that you can’t book, so it can be tricky to get in. And you’re not allowed to be seated until all your party is there. So bear in mind that you may have to queue (which you also can’t do if all your party aren’t there, though you could have a drink on the side), or go earlier or later for lunch and you should be okay. It’s really worth the effort.